No one likes Spirit Airlines, the “no frills” carrier that has crafted a powerful new brand in the industry not by trying to be nice to customers but by stressing that if you want to fly cheap, you will be brutalized — and you will be thankful. Come for the low fares and high fees. Stay for the opportunity to be a Spirit hater — and join the crowd. Spirit is so committed to this attitude that it recently staged a marketing coup by offering 8,000 frequent flyer miles (“hate-thousand,” actually!) to anyone who would contribute to a survey about why they hate Spirit — and the competition. Baldanza was shocked — Shocked! — that consumers shared the hate. But of course it was a pretty canny move, as the results are now in. They pretty much hate all airlines. For some reason. Flying with Spirit is different because it sells itself as practicing “frill control.” Spirit doesn’t offer what passenger don’t need. Before Spirit came along, passengers didn’t actually know this — and that was the airlines’ fault. They had trained travellers to expect frills — frills that became associated with even a cost-conscious flying experience. To Spirit’s credit, the airline saw this as a opportunity: its value proposition would be that Spirit, the expert, would thoughtfully eliminate frills and pass on the saving to customers, who would grumble all the way to the bank. As you can see, the hate is spread around pretty liberally, across a variety of categories. Spirit is aiming to accelerate its growth this year, according to Businessweek, which could invite the ire of larger airlines currently operating in markets that Spirit wants to enter. In that context, the State of the Hate report is a pre-emptive strike, proving that although Spirit is known for being despised, the other carriers don’t have a compelling counterargument for why they aren’t just as bad. The airline industry is splitting into two service categories: low-cost and high-cost. At the low-cost end, the competition is ferocious — so much so that innovative carriers such as JetBlue, an airline that has enjoyed a lot of love from consumers, are seeing their business model undermined. Pricing is everything. At the high-cost end, it’s all about premium amenities, impeccable service, and the affluent business traveller. Profit margins drive this end, making up for a lack of volume. Basically, you have one group of flyers who want to get from point A to point B as cheaply as possible; they will put up with anything to have an extra $US50 or $US100 left over. And you have another group of flyers that want to be swaddled in comfort and pleasure and doesn’t mind paying for the privilege. Spirit’s goal is to prove that you can offer essentially nothing but a seat and 35,000 feet to a large segment of the market and thrive. Meanwhile, other airlines are turning their planes into flying nightclub/hotels. 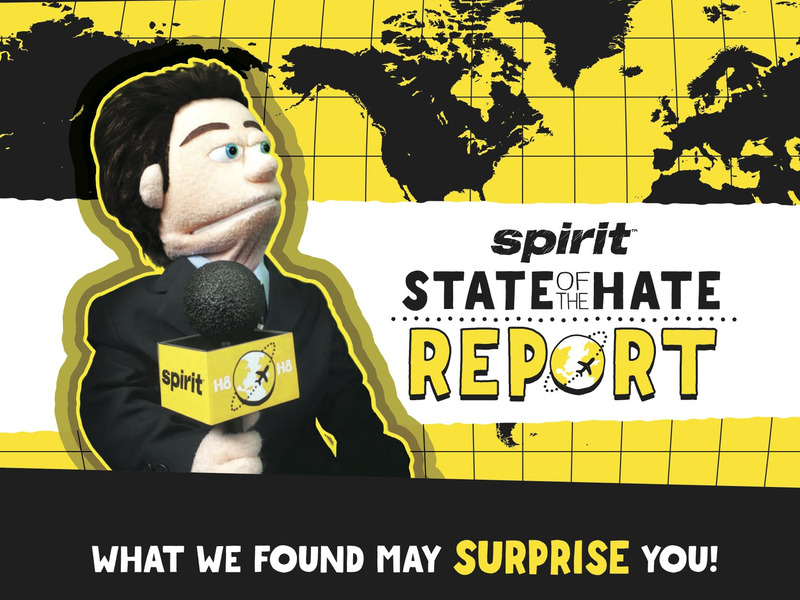 To bolster its case, Spirit also produced a completely hilarious video to go along with the State of the Hate report — a profane faux-newscast starring…puppets.